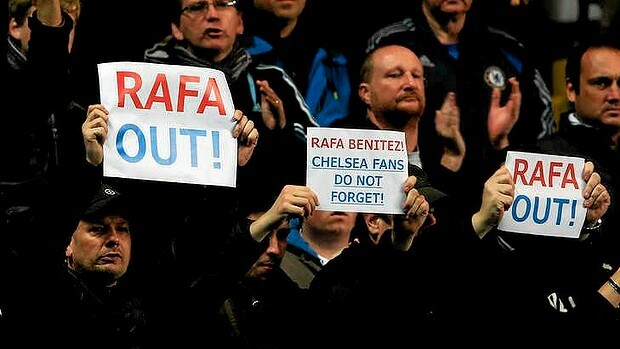 Fans holding up signs calling for the departure of Rafael Benitez from Chelsea. 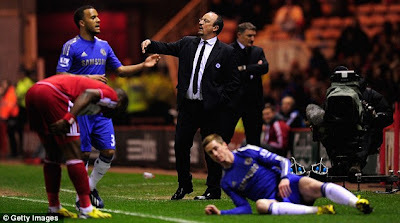 LONDON: Worn down by constant criticism by fans, Rafael Benitez announced on Wednesday he would leave Chelsea at the end of the season during an extraordinary post-match outburst in which he also took aim at the premier league club’s hierarchy. The Spanish coach snapped during his post-match press conference after an FA Cup fifth-round win at Middlesbrough, saying his position had been untenable ever since he was handed the title ‘‘interim manager’’ until the end of the 2012-13 campaign. 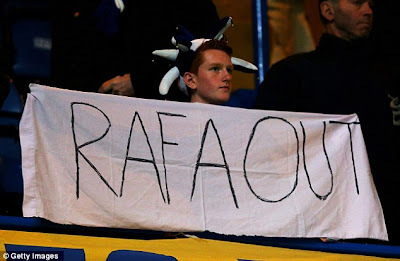 ‘‘I will leave at the end of the season – they don’t need to waste time with me,’’ said Benitez, referring to some fans who barracked him at Riverside Stadium. Benitez was hired as the replacement for the fired Roberto di Matteo in November, but has never been accepted by a large section of Chelsea fans. Many are still angry at Di Matteo for departing, after he led the club to its first European Champions League title last season. 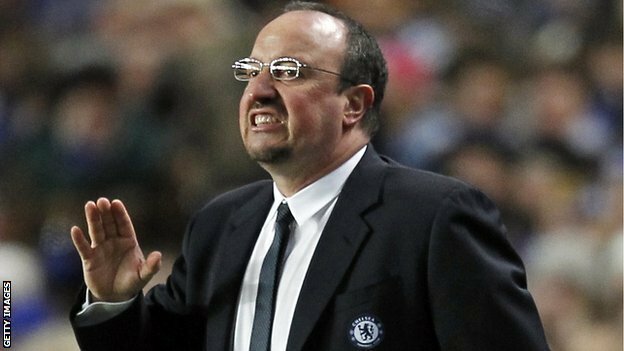 Others have not forgiven Benitez for allegedly disparaging comments he made toward Chelsea while he was Liverpool manager earlier in his career. Others do not like his style of football. Benitez, who said some fans have had an ‘‘agenda’’ against him ever since he joined the club, launched a passionate defence of his managerial record. ‘‘I have been in charge in football for 26 years – I have won the Champions League, won the FIFA Club World Cup, the FA Cup, the Italian Super Cup, the Spanish league twice. Benitez had already spent most of his news conference playing down reports of a bust-up with players at a training session after Sunday’s 2-0 loss at Manchester City. ‘‘I am the manager and I will be managing the team I like to manage – players and no names,’’ Benitez said. ‘‘If a group of fans continue their agenda ... they are not making any favours for the team. They should concentrate on supporting the team. 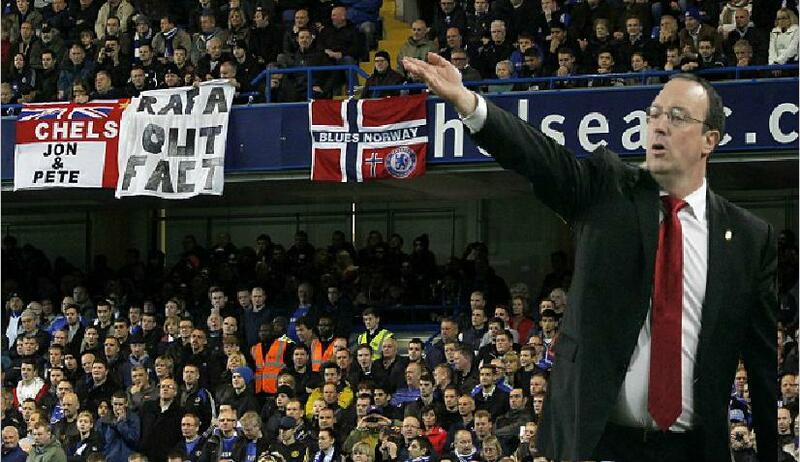 Chelsea did not comment on the outburst, but he could struggle to stay now he has criticised club officials.